Country Song Ain't Easy is a sort of indie "Outlaw Country" Pop song with a nod to the singer/songwriter attitude. It's an honest observation about the world of Country Pop, and how there really isn't much "Country Music" in there. 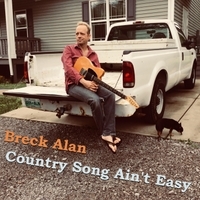 Breck Alan has been releasing songs into the world since the late 1980's. Having toured the world over, Breck hangs out mostly in Nashville these days recording his songs in his private studio, and playing random showcase shows. More tours are probably in the future, when Madison Square Garden gives a call.